In 1937 when Congress was giving consideration to making the CCC an official agency, official uniforms were developed rather than the WWI Army surplus they had been wearing. When these forest green wool uniforms were developed the logo that is generally thought of as being the CCC logo was developed and was displayed on the arms (shoulders) and campaign hats. I have attached a scan of an original patch. From the perspective of flags, there were many. Each camp seems to have something to highlight their name and camp number. 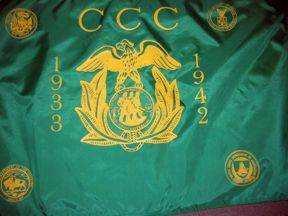 Now that I think about it I can't honestly say that I have ever heard of an official CCC flag. As I think back through photos of camps, etc., I don't remember one instance where there was anything but the US. 48 star flag. The CCC never was an independent agency. The camps were managed by the military and the projects were managed by the conservation agency. In a conversation last year with an unremembered individual he mentioned that the only existing CCC flag was in the Smithsonian, however here again, he had no history on the flag. My question to him was it an official government flag, a prototype, or was it a handmade flag crafted by an ambitious admirer. So I left the conversation with no more information that I can offer you now. 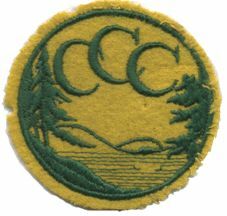 Now, here's a semi official website called CCC Legacy (www.ccclegacy.org ) which "is a non-profit membership organization established to promote the heritage of the Civilian Conservation Corps". They highlight the Legacy of the Corps and also have links to Museums and Collections. As this story tells, the CCC was never a permanent Agency established by Congress, but rather a temporary employment measure under a government policy ("New Deal") to endorse WWI veterans' rights. (see CCC and Bonus Army. Under the Reorganization Act of 1939, which was designed to reduce the number of agencies reporting directly to the President, led to the creation of the cabinet-level Federal Security Agency (FSA) which included Social Security Board (SSB) succeeded by the Social Security Administration (SSA), the U.S. Public Health Service, the Food and Drug Administration, the Civilian Conservation Corps, the Office of Education (later the U.S. Department of Education), the National Youth Administration and a number of other agencies. The FSA was also a cover agency from 1942 to 1944 for the War Research Service, a secret program to develop chemical and biological weapons. In 1953 the Reorganization Plan No. 1 of 1953 was enacted and the FSA was abolished and most of its functions were transferred to the newly formed United States Department of Health, Education and Welfare (HEW), succeeded by the Department of Health and Human Services (HSS). It looks like that the CCC did not have an official flag, nor did its director. Here is a picture of what turns out was the 50th Anniversary flag. This flag was not an official flag of the CCC, but a memorial flag that was made to celebrate the 50th Anniversary of the CCC in 1983. It is unknown who the manufacturer was but we assume that it was a member of the NACCCA organization at the time. The Departments of War, Labor, Interior and Agriculture are represented by their logo and the image of the Spirit of the CCC celebrating the 50th Anniversary is held by the eagle.